Joan Mitchell looks to be the only artist of her generation, man or woman, who produced a big, abstract, painterly painting that can stand up to the best of de Kooning and Pollock. The legions of arrogant young men who swaggered into the Cedar Tavern have been eclipsed by this woman who probably had more self-confidence and certainly had a more abundant gift than any guy her age in the room. She could drink any man under the table. She swore like a trucker, and didn’t suffer fools – her tongue could be knife-sharp when someone annoyed her (which was often). She had a string of lovers and pet dogs – the dogs were the most important animals in her life. She loved jazz and Bach. She loved the poetry of Rilke and Eliot, and her friends John Ashbery, Frank O’Hara and James Schuyler. Her painting throws up sharp and cutting light on the world. Glorious, huge canvases that owe a debt to Van Gogh and Cezanne, but were at the time completely modern – vast swathes of yellow, violet, blue, khaki, orange (her palette, each hue attuned to some deep emotion / person / location). Her paintings are both chaotic and controlled, and are about gesture, layers of consciousness, the deep well of emotion, memory, time, and above all, place. She soaked up her surroundings, and saved them for when she was ready to put brush to canvas – she said she carried her landscapes with her. She spent meticulous hours in the making of a painting, and could scrap the whole thing if it wasn’t going well – she was her fiercest critic. She is, in my opinion, one of the great painters of the twentieth century, on a par with her contemporaries, Pollock and Rothko. But often when I mention her to friends, fellow poets, even some artists I know, they are for the most part unfamiliar with her work. It is true she is better-known in America, as the US museums hold the greatest number of her paintings. But she lived for the latter half of her life in France, and thought of herself as much European as American. 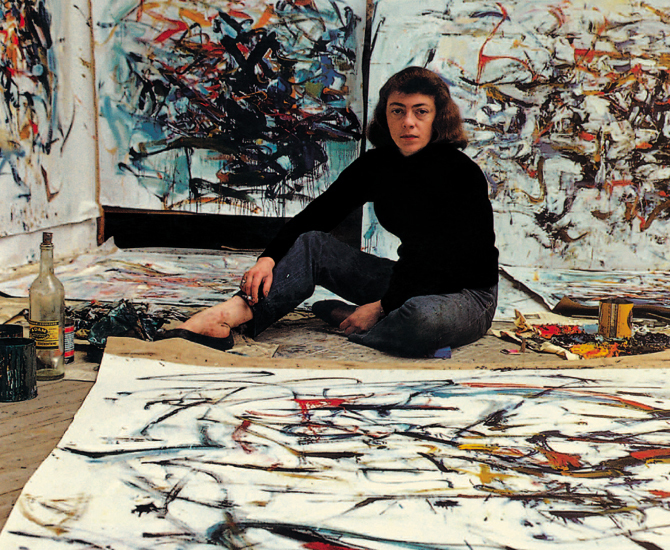 So why is Joan Mitchell not more famous? She understood the problem herself. In a world of butch gestural statements, the swagger and bravado of Pollock, the rugged stance of de Kooning, she was simply a ‘lady painter’, and as such had to fight for recognition from the (male) critics more intensely than the boys. 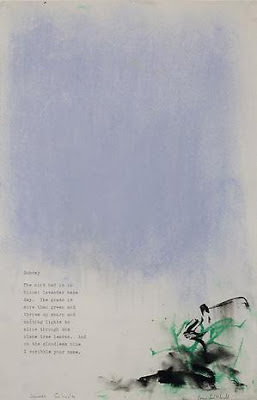 She was not alone – painters such as Lee Krasner and Helen Frankenthaler had a similar struggle; and like Mitchell (whose partner was the internationally-renowned Canadian painter Jean-Paul Riopelle) both were subsumed by their more famous husbands – Jackson Pollock and Robert Motherwell. But it could be argued that Krasner was instrumental in guiding Pollock to achieve his signature drip technique. She was a quieter and more controlled painter, able to intellectualise what Pollock created through action and movement. And when Frankenthaler saw Pollock’s work for the first time, she promptly started placing her canvases on the ground. But while Pollock’s gesture was fast and frenetic (as captured in the films of Hans Namuth), Frankenthaler’s was slower, considered, more fluid. What Mitchell brought to the party was her astounding sense of colour. Her synesthesia enabled her to see colour in music, in numbers and letters. When she moved to France, living in the shadow of Monet’s garden, she understood his swirling lavenders and blues, but added another dimension to the rendering of that famous landscape – the colours of the mind. Mitchell’s work is immediate and encompassing, but behind the brushstrokes is a deeper meditation, something that goes beyond looking. You fall into her paintings, as if diving into a tunnel. Like Howard Hodgkin, a painter I think shares affinities, there’s a private world behind the public gesture – despite their often epic size, her paintings are about small moments held in abeyance. Tamar Yoseloff’s fifth poetry collection, The Formula for Night: New and Selected Poems was published by Seren in 2015. She is also the author of Formerly, a chapbook incorporating photographs by Vici MacDonald (Hercules Editions, 2012) shortlisted for the Ted Hughes Award for New Work in Poetry; and three collaborative editions with artists (Marks and Desire Paths, with Linda Karshan; and Nowheres, with David Harker). She lives in London, where is a freelance tutor in creative writing, often combining poetry and the visual arts in courses for galleries such as the Royal Academy and the Hayward. What a lovely, warm and exciting post! Thank you.